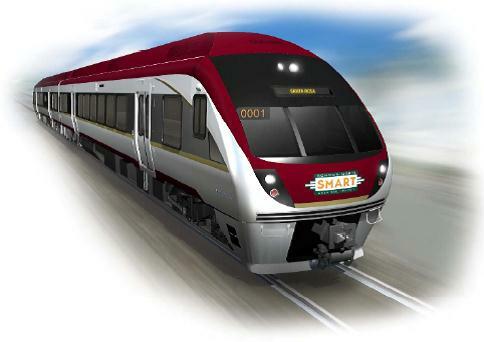 SMART has received bids from DMU vendors. And as predicted, those bids are way above the market price for DMUs. So how has SMART staff reported this news to the Board? The price proposal from SCOA is very favorable to SMART, so much so that it became clear in the evaluation process that its acceptance without further change was in the best interest of SMART…SMART’s estimate for this base order prior to opening of the price proposals was approximately $80 million. The recommended award is for a contract that is about $23 million below the engineer’s estimate. The lowest bid (Sumitomo Corporation of America) was $56 million for 9 DMU trainsets; i.e. $6 million per trainset. Similar projects in Europe are considerably less expensive, around $3-4 million per trainset. For example, Alstom’s sale of 23 DMU trainsets for $90 million to Hessische Landesbahn GmbH (transit operator in Hesse, Germany). Or this Deutsche-Bahn order of 30 DMUs for $96 million. Even worse, the Sumitomo bid isn’t for a real train. It exists only on the drawing board. The SMART riders will be the ones to test and debug it. So how did they get to this point? Answer: the usual reasons…staff specifying custom-designed rolling stock, and refusal to pursue FRA-waiver. The regulatory flaming-hoops-of-fire (FTA Buy-America rules, and FRA/PUC screwiness). Just another example of how American transit riders pay more, and get less. Wait, is this $6 million for a single DMU, or for a DMU set? DMU set wouldn’t be so bad, but single DMU would be more expensive than what Europeans pay for freight locomotives. The price per car or trainset is high because the overall order is small. Train manufacturers have a big ramp-up for new orders… ones that require a change relative to the prior order. Those ramp-up costs are passed on to the buyer…. but, are more diluted with bigger orders. SMART would have been better off if they had tagged onto a pre-existing order, rather than seek bids. However, there might not have been any pre-existing contracts to tag onto. The HLB order for 23 DMU trainsets is small too. SMART cost escalation is due entirely to reasons given: the custom specifications, Buy-America nonsense, etc. BTW, we will see similar cost escalation during operation. The superfluous crew requirements, poor fuel economy, and (almost certainly) higher maintenance. The O-Train’s fleet is three three-car DMUs. The cost of the entire line, including not just the trains but also stations: $21 million. Ottawa piggybacked on a much larger Bombardier Talent order from DB; it didn’t even repaint the trains, because the DB colors are close enough to OC Transpo’s livery.